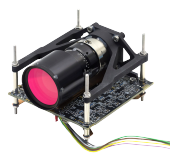 The Gecko imager is an easy-to-integrate imaging solution for your CubeSat mission. A customizable high performance mass storage unit is integrated into the compact design. The Gecko imager offers mechanical compatibility with standard frames. RGB images are captured at up to 5 frames per second† using a matrix sensor in snapshot (global shutter) mode. Image data is captured directly to the integrated mass storage. Data may be streamed out to an on-board computer and downlinked a lower data rate, as required. Reliable operation achieved by using a combination of proprietary hardware and space-proven ruggedized optics.